This is the second part of a two part article written by Park Tudor (Indiana) High School Head Coach Ed Schilling. Under Coach Schilling Park Tudor won the 2011 and 2012 Indiana 2A State Championships. He has been the Head Coach at Division I Wright State, has served as an assistant coach for John Calipari at UMass, with the New Jersey Nets, and at Memphis. Ed serves as a Head Coach for the Adidas Nations Program. Ed operates Champions Academy in Indianapolis–a skills training academy for players of all ages and skill levels. The highest profile players who work out with Coach Schilling are NBA and pre NBA draft prospects. At least one first round draft choice in each of the past 6 NBA drafts has worked out at Champions prior to the draft. In every player’s career, he will often come face to face with the temptation to turn his focus toward himself and away from the team. What direction the player chooses at that “crossroad” will impact his future success, the team’s success, and also the quality of the player’s experience. The decision to turn selfish can be prompted by a well-meaning family member, a peer looking to encourage or even a sports agent trying to help make his client appear more marketable. Subtle comments like, “you ought to be playing more minutes”, “you were open a lot and didn’t get the ball”, “you need to score more”, “don’t understand why so and so shoots so much”, “you are being played out of position”, “you need to show the scouts your shooting range”, etc., etc., can be the little spark that sets the forest of selfishness ablaze for the unsuspecting athlete. The “disease of me” can affect the leading scorer, the point guard, the sixth man or the player at the end of the bench. This can also impact a coaching staff member as well. An assistant coach who thinks his ideas need to be used more readily by the head coach can fall victim to the “sickness of selfishness” which could potentially weaken the team. 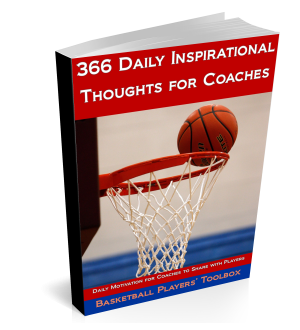 When a team member (players and/or coaches) comes to the crossroad of moving his thoughts (which eventually will become actions) from what is best for the team to what is best personally, that negativity spreads on the basketball team and is detrimental force. It must be dealt with like cancer. Cancer treatment is often immediate, aggressive and fierce. To rid the body of cancer may require painful surgery or chemotherapy that uses strong chemical agents to kill the cancer cells. Perhaps you have heard of a player being referred to as “a cancer” on the team. A bad attitude acts like cancer to the body of a team. One player with a bad attitude has the potential of soon becoming two. Misery does love company. In the game of basketball not everybody gets 32 minutes and 32 shots in high school or 40 minutes and 40 shots a game in college or 48 minutes and 48 shot attempts in the NBA. The potential to be sucked into unhappiness is available to all who play. The “strong chemical agent” on a team is the head coach and it is often he who must recognize and diagnose the most appropriate treatment to rid the team of the cancer. However, the assistant coaches can be significant in helping cure the selfishness if it is caught in time. In many situations, a fellow teammate can see the “sickness” brewing and can try to save the player before he becomes too contagious. The key for a team is to understand that conditions are always right for a self-serving tornado to wreak havoc on the team and to be alert. And, if a selfish and bad attitude has been sighted, then urgent measures must be taken to protect the team from potential and pending disaster. If you are like me you have probably lost your cell phone or had your phone or computer crash at some point in your life with all your important stuff on it. My latest broken phone caused me to lose many important numbers. In fact, one day I had the brilliant idea to put all my user names and pass codes and also frequent flyer and hotel numbers in my smart phone. This was a long, tedious process, but one that seemed wise for it would keep me from carrying so many cards in my wallet and save me time trying to remember what user name went with what pass code. This great idea worked well… until the phone crashed. This was a while back, the Icloud hadn’t been perfected yet, and I hadn’t backed all my stuff onto my computer. So all the tedious work of entering my pass codes, user names in along with so many key numbers, etc., etc., etc., were lost into the abyss. In hindsight, significantly more measures should have been taken to protect my information and my phone. As much time as was invested in putting things like those frequent flyer numbers into my phone, players invest far more time into their basketball abilities. Players put in at least the required two hours plus per day of practice in season, and additionally work out in the weight room and on the practice court countless hours on their own away from the team. The time investment into a season is almost impossible to calculate. Way more unfortunate than a crashed computer or a lost phone is a season corrupted by selfishness and negative attitudes. I have been able to recover almost all of my lost numbers from my broken phone. However, the good times, the life long relationships, and exhilarating victories that are prevented by a team infected with the horrible “cancer of selfishness” are worse than lost for they never happen when selfishness invades a team. The wise coach, athlete and parent will be constantly aware of the dangers of the insidious “disease of selfishness,” the thief who has the potential to steal, kill and destroy the unsuspecting athlete and team. Alertness and protective actions facilitate the highly positive desirable by-products of being part of a team—incredible enjoyment, recognition, life long friendships and victories. If you have any feedback for Coach Schilling, email me at info@coachingtoolbox.net and I will pass it along to Coach Schilling.